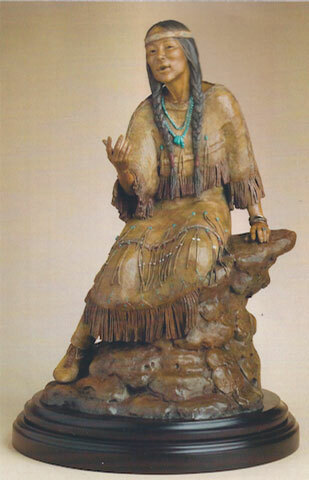 Star Liana York, TeAta, Storyteller, bronze, 28" x 17"
"TeAta was a Native American, who performed in the early 1900s. She was best known for the play she wrote and performed that told of the history and culture of her tribe. It became widely renowned, and she traveled all over the world, telling the story of her people in front of audiences that included kings and queens." Star York’s sculptures have earned her an enviable reputation as a talented artist, whose works are a delightful combination of composition and color. Whether she is depicting people or animals, she is driven to create renditions that are anatomically accurate and aesthetically appealing. Her success in accomplishing both is evident in impressive sales and loyal collectors. York comes from a long line of creative people. Her mother was a ballerina “and a romantic,” she says, who was a dancer in New York in the ‘30s and later worked at a dance studio. York’s father was an engineer by trade and a woodworker in his spare time. “Every night he went into the studio and built things, like furniture,” York says. “He was creating with his hands. He also had built sets for the stages for the dance studio. He would give me big slabs of wood, and I would draw on them and cut little figures with the jigsaw. I was five or six then. Growing up in a rural area of Maryland, York also collected animals – ducks, rabbits, and chickens. When she was a teenager, she and her sister pooled their babysitting money and bought a horse that York rode in barrel races and at rodeos. She wnet on to spend almost two decades training and raising horses and currently has six. “I also have a couple of goats and dogs and cats,” she says. Today York is living on a ranch near Santa Fe, New Mexico, with her husband Jeff Brock, who she met after she moved to Santa Fe to be near her foundry. “He had had an electrical contracting company in Michigan, but always wanted to be an artist, so he moved to Santa Fe and worked for the guy who made my enlargements,” she says, adding that today he makes jewelry, works with her on her monuments, and also holds five world records in land speed racing. 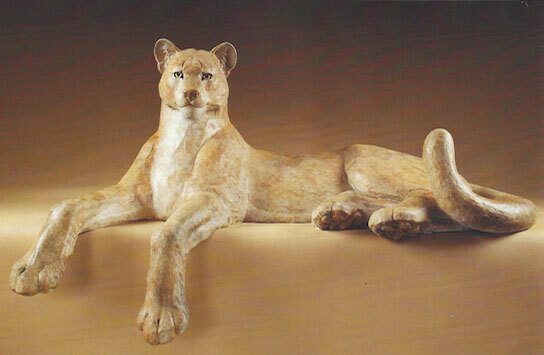 Star Liana York, Cougar, bronze, 48" x 23"
"The expression on this mountain lion comes from our big catm who loves to stretch out on his favorite rock, proudly surveying his domain." “We’ve been married for 11 years and live in Abiquiu, Georgie O’Keefe country. We’re right on the river, have a pasture for our horses, and a national forest right here.” She laughs when asked about the origin of the ranch’s name – Pair O’Dice – and quickly attributes it to Brock and his quirky sense of humor. It’s the perfect setting for artists, who work in a studio they built near the house several years ago. 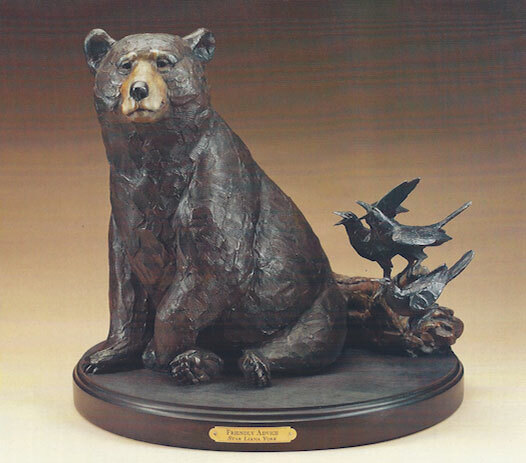 York began selling her silver miniatures through a gallery in Annapolis immediately after graduating from high school and went on to study art at the University of Maryland. “I had enough credits to graduate but they didn’t give me a diploma, because I had too many [unpaid] parking tickets,” York says, adding that the infringements came often, as she parked illegally in order to lessen the distance she had to haul her art supplies and projects to where she needed them to be. “I needed the money more than I needed the degree,” she adds with a laugh. While in college, York also took classes at other schools, including the Institute of Art in Baltimore and the Corcoran College of Art & Design in Washington, D.C, in order, she says, to get a well-rounded education by studying with various instructors. “I would take off a semester and go to a different school,” she says. Although she had received a full scholarship to the University of Maryland, York was in a car accident when she was 19 and, because she was required to take a full credit load in order to retain the scholarship, she had to let it go and work part-time in order to pay for her schooling. 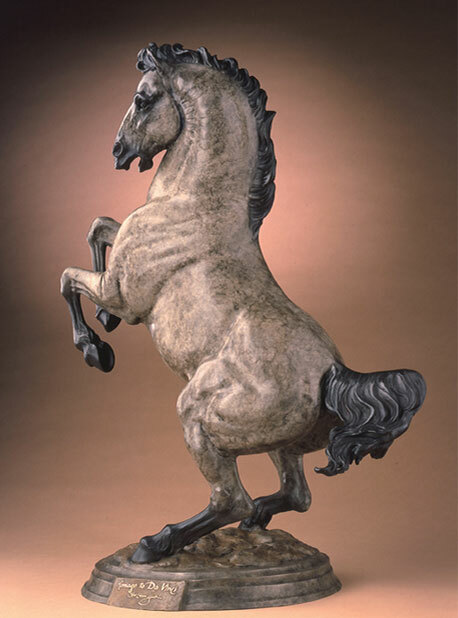 Star Liana York, Homage to DaVinci, bronze, 36" x 23"
"Leonardo DaVinci sculpted few horses in his life, but did a series of beautiful drawings of horses, some of which were sketches for battle senes. He was able to capture the warhorse's expression, reflecting the expression of the face of the soldier riding him, an accurate observation of how horses can become true extensions of their riders. this certainly is my experience with my own horses, and so I was inspired to sculpt this." York received a real eye-opener one day while lunching with the gallery owners. “They said that, when they bought the gallery, the former owner warned them not to take on women artists, because they didn’t sell well,” she recalls. “As long as I didn’t show up [to a show] I could sell well. People either wanted me to be a man or an Indian.” Thankfully, those days are long past, as women artists, including York, have earned their places among the best Western artists in the world. 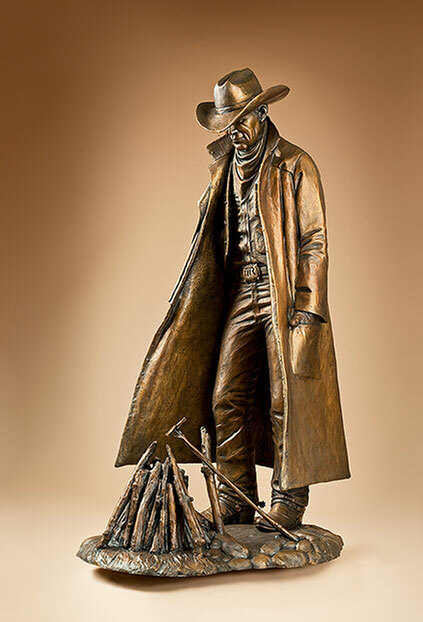 Star Liana York, Range Duty, bronze, 75" x 44"
This sculpture depicts a rancher who has come upon a n unbranded cow while riding the range and is trhying to get af ire going to brand the maverick. As can be typical the weather is not cooperating, as blustery winds bring drizzling raon, and he shelters the struggling embers with his slicker. Despite the adverse conditions, his expression shows the love of his work. 'The highest reward for a man's toil is not what he gets for it, but what he becomes by it' - John Ruskin"
York’s inspiration, she says, usually is the result of something she experiences. That was the case with a medicine woman she met during a Native American ceremony several years ago. 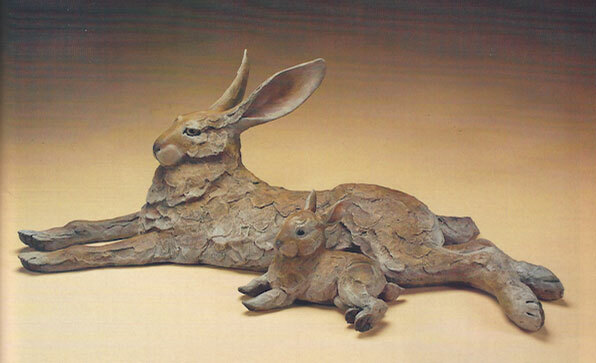 Star Liana York, Like Father, Like Son, bronze, 28" x 12"
"We have very big, well-fed jackrabbits who inhabit our ranch, and we often see them relaxing around. Even the baby jacks seem to know our dogs don't post much of a threat and imitate the adult's relaxed attitude." Star Liana York, Friendly Advice, bronze, 18" x 20"
"This sculpture is part of a series I've titled The Raven Dialogs. I've been entertained for years by our resident ravents' interactio with our dogs before visiting a black bear refuge, where I saw the same amusing relationship between the raens and bears." 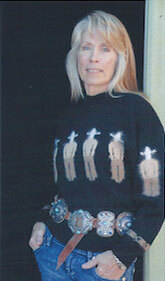 York started selling her work at outdoor art shows, when she first moved to the Southwest. Her first major show was the National Sculpture Society Exhibition in 1978. That year, and the next she won the Best Miniature Award. Today she participates in several shows each year, including Cowgirl Up!, and in fundraisers for a horse shelter and an animal shelter. “I like the idea of giving back,” she says. Unlike most sculptors, York does not begin work on her pieces by first drawing them. Instead, she composes in her mind. “When I draw on paper, I’m drawing a two-dimensional plane,” she says. “If I turn it around in my head, when I start the piece I can see how it will evolve. I don’t want to fall into a formula. That can work in terms of sales, but then all you’re doing is the same thing; you’re not engaging your mind or creativity.